Why Won't Twitter Tweet These Tweets? 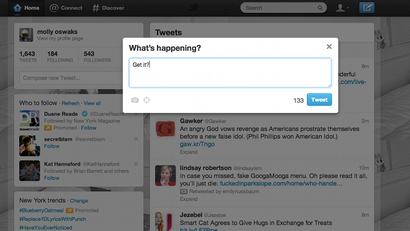 Do this right now: Go to Twitter and type the words "get help." Or try "get hungry" or "get high" or "get laid." Really, any two-word pair beginning with "get" will do. Now send the Tweet. What's that? It vanished? Exactly. Until just moments ago, I, like you (probably), had been naive to this snafu. It was Former Gizmodian John Herrman who shed light on the situation. The "get" glitch, as it were, is actually an anachronism from an earlier iteration of Twitter as an SMS service. There are others, too. A whole list of text commands exists to this day, from which weird Twitter traps can be deployed. •WHOIS [username] - retrieves the profile information for any public user on Twitter. Example: whois jack or w jack, for short. •HELP - texting help or info to Twitter will bring up helpful tips. •GET [username] - retrieves the latest Twitter update posted by that person. You can also use g [username] to get a user's latest Tweet. Examples: get goldman or g goldman.